Plot: Gloria is an out-of-work party girl forced to leave her life in New York City and move back home. When reports surface that a giant creature is destroying Seoul, she gradually comes to the realization that she is somehow connected to this phenomenon. Starring: Anne Hathaway, Jason Sudeikis, Austin Stowell, Tim Blake Nelson. 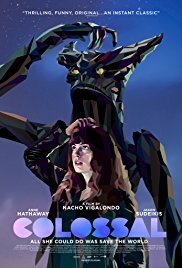 distributed by Neon «Colossal» in the US movie theaters released on April 7, 2017 and has grossed over $3 million worldwide; dvd and blu-ray release date was set for August 1, 2017. Rent from Netflix and Redbox from August 1, 2017. «Colossal» in the UK released in movie theaters on May 19, 2017. The movie released on dvd and blu-ray on September 11, 2017.